Black pepper is a fruiting herb that is native to India, and enjoys the heat and humidity of the tropics! It will provide rich foliage and interest to your urban farm for years, until it begins to give forth its spicy seed in plenty! SEASONS: Black pepper is a perennial plant. It is well-suited to Mumbai and can be sown and grown in all seasons, though the monsoons are better for propagation through cuttings. PROPAGATING: This plant is propagated through seed and cuttings. Buy seeds from your garden shop or raid your kitchen shelves for some! GERMINATING: Black pepper seeds (non-roasted) can be sown 1/4 inch deep in germination dishes/seeding baskets prepared with a mixture of compost and peat moss. Seeds can be shown in 1/2 inch deep holes. Place in semi-shade and spray water evenly. Spray your sown seeds daily until seedlings emerge in after 2 weeks to a month. PLANTING OUT: Transplant to slightly acidic, very well-drained, compost-rich soil in full sun after 2 weeks of growth. Space out seedlings at least a foot apart, as black pepper spreads its roots wide. If you are propagating through cuttings, ensure that you plant your cuttings deep, and water well. Black pepper is a vine that needs support, so it is a good idea to grow it as a companion plant along with tall perennials like tropical fruit trees. Black Pepper will grow well in containers or on open plots. NURTURING: Your seedlings/cuttings will grow slowly but surely, given frequent and deep watering. It is resistant to most insects but may need some organic spraying to deter leaf eaters. Its vines are succulent and fragile, so support them well as they can keep growing till 15 feet in height and more. 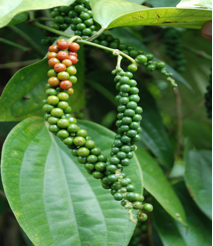 HARVESTING: Black pepper has a long growing season and it will take 3 to 4 years for your plant to start bearing fruit. The fruit is harvested when fully-grown and red in pods. The pods then need to be harvested, the pepper seeds separated, and dried for at least 3 days until completely blackened before storage. Your plant will keep growing and producing harvests thereafter, so you can enjoy a lifetime of fresh black pepper! Will the organic pepper purchased from supermarket germinate? Peppercorns – organic or otherwise – will germinate if they are fresh and have not been roasted/cooked/refrigerated. It would be a good idea to soak them overnight before sowing in rich, well-drained soil. They need warm and humid temperatures for germination and may take up to one month to come overground. Can you help me find pepper farm in Mumbai? A pepper farm….I don’t think we have any in Mumbai. Pepper is grown commercially in South India, not in Maharashtra (perhaps southern coastal districts) and they are certainly not likely in Mumbai.